Taylor King Law is Tackling Legal Terms. Each week we’ll explain common legal terms in plain language, vocabulary that will be helpful if you ever experience a car wreck or personal injury in Arkansas. Have you used the term “damages” recently? If so, you probably used it in the context of this definition: “The physical harm caused to something in such a way as to impair its value, usefulness, or normal function” – unless you were referring to Damages, the hit television show. When used in a legal setting, however, “damages” take on a related, yet distinct meaning. Damages fall under two basic categories: compensatory and punitive. 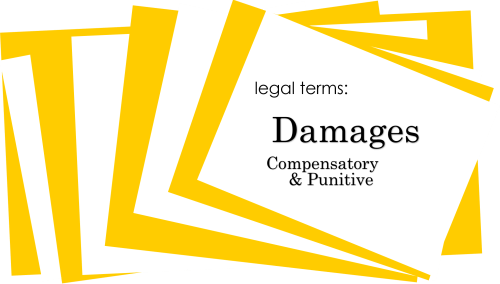 What is the difference between compensatory and punitive damages? Compensatory damages are the type most commonly award in personal injury cases. They are meant to reimburse or compensate you for the harm that you’ve suffered, whether that’s physical, financial, or medical. When it comes to compensatory damages, the focus is on the plaintiff: helping them recover the loss they’ve experienced. The logic is fairly clear. If you were injured, you should be reimbursed for your medical bills and treatments. If your car was damaged, it should be repaired. If you were unable to work after the accident, you should be compensated for the wages you missed. The dollar amount awarded for compensatory damages is typically proportional to the severity of the loss. You can expect to recover more in damages for catastrophic injuries, major medical issues, or serious property damage than for minor injuries or easily repaired damage to your vehicle. Punitive damages, on the other hand, are awarded in cases where the defendant was willfully reckless or caused deliberate harm. While the damages are still given to the plaintiff, punitive damages are meant to punish the defendant for his or her behavior. Many judges also hope that punitive damages will serve to ensure the defendant never repeats those actions and that other citizens will see it as a warning. To put it simply, punitive damages are a financial punishment for bad behavior. Compensatory damages may be awarded in any type of personal injury case, while punitive damages are given more rarely. Questions About Damages in Your Unique Personal Injury Case? While it’s always helpful to build your legal vocabulary, if you or someone you know has been the victim of a personal injury in Arkansas, it’s important to contact an experienced attorney. At Taylor King Law, our experienced legal team will ensure that you receive the maximum damages for your case and that your rights are defended. To begin your FREE consultation, you can call at 1-800-CAR-WRECK (227-9732), submit a form online at www.taylorkinglaw.com, or download the free Taylor King Law app for iPhone and Android. Don’t wait to get help – hire a lawyer who will be on your side, by your side!